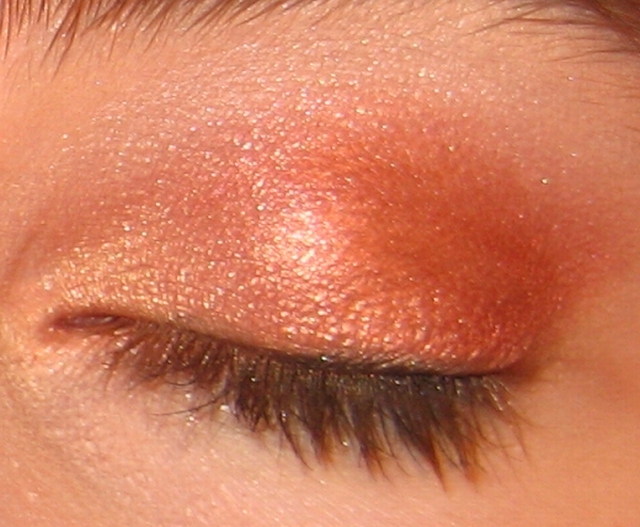 I mentioned in my Fall Look tutorial that incorporating some high-end makeup into your collection can bring your low-end things up to a higher level. It doesn’t take much, just a few products, and you can look like a million bucks without braking the bank. Here are a few items from MAC that I suggest you buy to use along with your other cosmetics. 1. Get something you can use as a base for all your eyeshadow – this can be a paint, paint pot, shade stick, cream color base, or prep & prime. 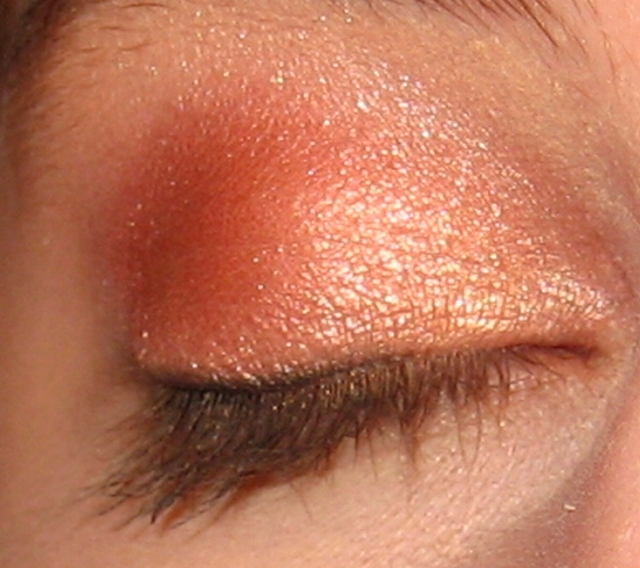 Pick something that you like the texture of and choose a shade that is close to your skin tone. 2. Pick two or three eye shadows that you can use on a regular basis and that work well with other shadows you already have in your collection. Don’t pick anything that, while it looks pretty in the pot, you would only use once in a great while. 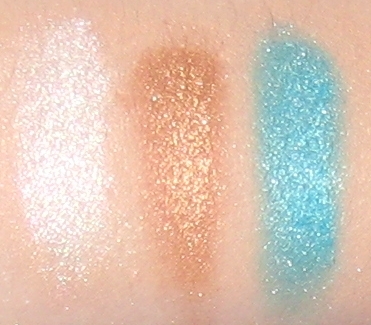 I suggest getting one that is white/off white/cream to use as a highlighter, but the rest can be whatever you choose. 4. Lipstick or gloss. Pick a color that is flattering to your skin tone, comes in just the right finish, and works well with your other makeup colors. You could also get a clear gloss to add over the lipsticks you already own. I don’t recommend buying mascara from MAC (or anywhere high-end) if you’re on a budget because you have to replace it so often. Mascara needs to be replaced every 2 – 3 months because of bacteria and yes, even eye mites (soooo gross!!). If your mascara stings your eyes or is three months old, it’s time to toss it. I suggest using a permanent marker to write the date you opened your mascara somewhere on the tube so that you can know for sure how old it is. I recommend N.Y.C. mascara – it’s $2 for thickening, lengthening, or waterproof mascara and $3 for curling. You just don’t want to pay more than that because of having to replace it sooo often. 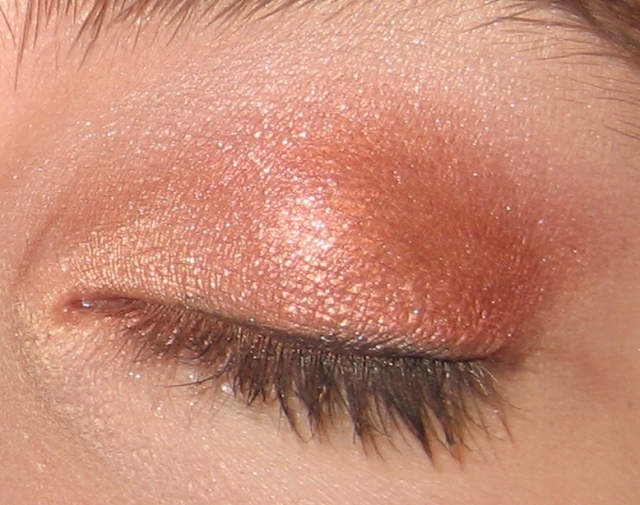 Also, I’ve heard that drugstore brands actually work better than many high-end brands! I can’t get enough of this stuff, it is amazing! The only place I know of where you can find it is WalMart (please help me out if I’m wrong, guys), but it is well worth any extra effort it might take to get these babies. It’s less than a buck for one of the pots and these things are filled til they can’t get filled no more! 😉 And you’re able to get a brush into the pots as well, unlike with NYX LOOSE PEARL EYESHADOW. 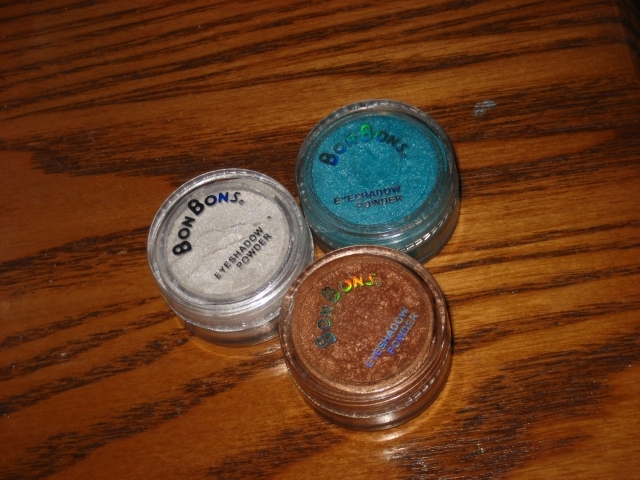 I have white, bronze-gold, and aqua. 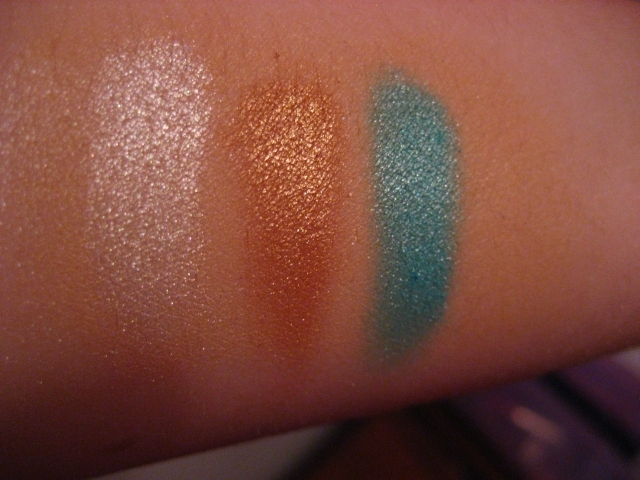 There is also a light lavender and a light gold shade that I need to try. 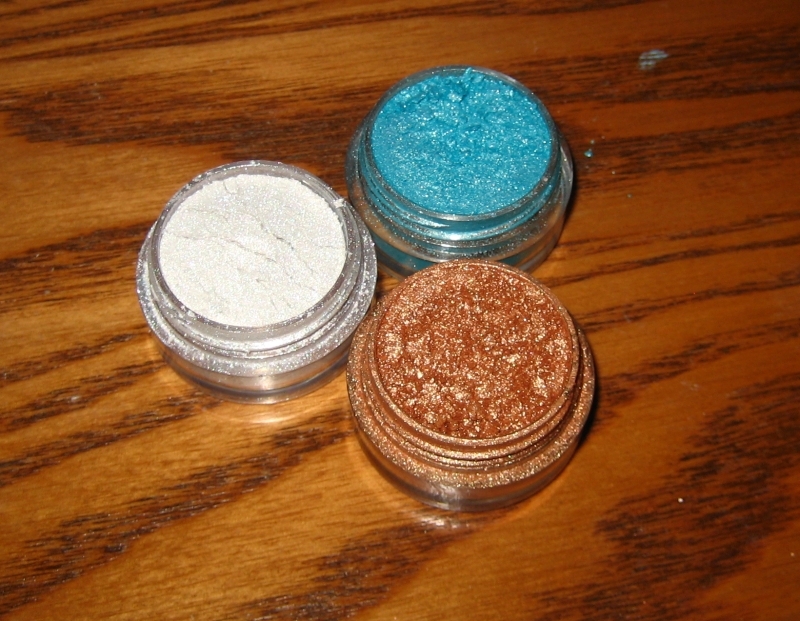 The colors I have are so pretty and sparkly – but not too sparkly so that it looks like glitter. I use the white and bronze-gold as highlighter on my cheek bones and I mix them in with lotion and/or liquid foundation to give me a dewy glow (if you’ve never tried this … well, you need to 😉 ). I do wish they had more colors, but maybe they will in the future. 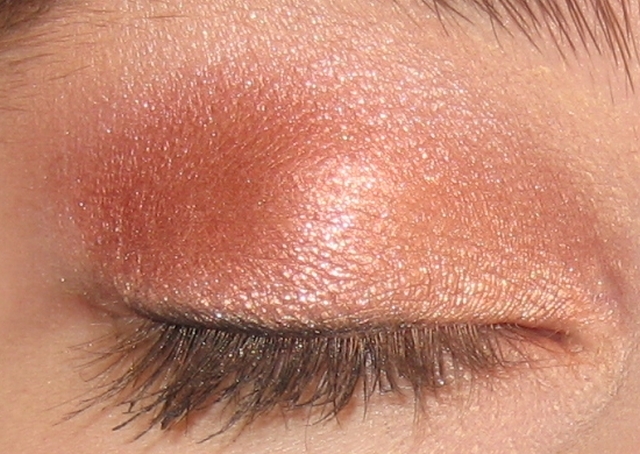 Send me a picture of a look you’ve done that incorporates BonBons Eyeshadow Dust – I’d love to see how you use it and I’ll post it in my blog as well. Here are a few pictures for ya. I used Physician’s Formula Twins concealer as a base.